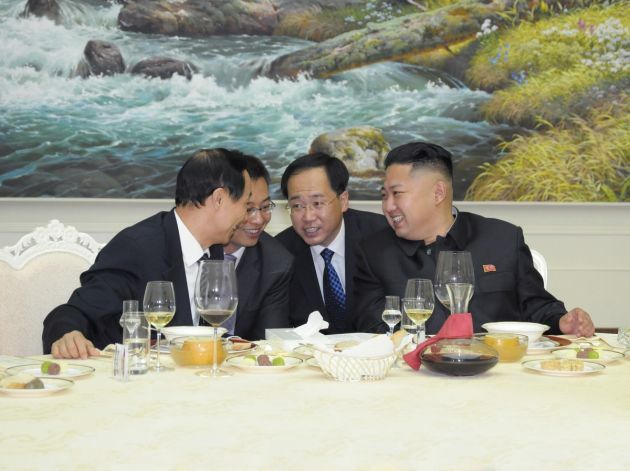 (Photo: REUTERS / KCNA)North Korean leader Kim Jong-Un (R) talks with Wang Jiarui (L), the head of the International Liaison Department of China's Communist Party, in Pyongyang August 2, 2012, picture released by the North's official KCNA news agency. The agency said this was the new leader's first reception of a foreign official since taking power. GENEVA, May 1 (Reuters) - Western powers called on North Korea on Thursday to dismantle its political prison camps and a caste system that ranks citizens based on family loyalty to the ruling dynasty. North Korea defended its human rights record in a debate at the U.N. Human Rights Council in Geneva, continuing to deny the existence of such camps, believed to hold up to 120,000 inmates. The Rights Council examined the record of the Democratic People's Republic of Korea (DPRK) as part of its scrutiny of each U.N. member state every four years. North Korea is to say on Monday which recommendations it accepts. U.N. experts said in February that North Korean security chiefs and possibly even Supreme Leader Kim Jong-un should face international justice for ordering systematic torture, starvation and killings comparable to Nazi-era atrocities that might amount to crimes against humanity. Robert King, U.S. special envoy for North Korean human rights issues, voiced concern on Thursday at the commission of inquiry's findings of "systematic, widespread, and gross human rights violations" committed by officials and institutions. "We are alarmed by the widespread use of forced labour, including child labour in detention facilities, and we remain concerned about instances of violence against women, forced abduction of foreign nationals, and reports of torture and abuse in detention facilities," King told the Geneva forum. He called for Pyongyang to shut political prison camps and to release all inmates. Former prisoners who defected, including Shin Dong-hyuk, gave harrowing accounts in testimony to the U.N. inquiry, whose members were barred from entering North Korea. South Korean envoy Ahn Young-jip also urged Pyongyang to close the camps and to "seriously address" the issue of foreign abductees, prisoners of war and separated families. Ri Kyung Hun of North Korea's Supreme People's Assembly said: "I'd like to reiterate that there is no political prison camp in our vocabulary nor prison camp in law or in practice." King also called for North Korea to end what he called "state-sponsored discrimination" based on the "songbun" system, which rates citizens based on their family's political background as "loyal", "wavering" or "hostile". "This is based largely on what their parents, what their grandparents did 50 years ago. And people are put in these social categories and...it determines whether they can attend university, what opportunities they have, what housing they have. It is a system of brutal discrimination," he said in remarks posted on the website of the U.S. diplomatic mission. Karen Pearce, Britain's ambassador, said that crimes against humanity were still being committed with impunity. Fundamental freedoms of expression, assembly and of religion were denied. "We call again for the DPRK to take action on the commission's recommendations, particularly by closing prison camps and investigating alleged violations," Pearce said. So Se Pyong, North Korea's ambassador, said his country was taking positive steps, including improving legal guarantees, education, and the rights of women, elderly and the disabled. "Certain forces obsessed with ingrained repugnance towards the DPRK are pursuing confrontation and pressures, deliberately ignoring the real human rights situation on the ground." Economic sanctions - imposed on North Korea due to its contested nuclear programme - threaten its people's right to existence and hurt the country's peaceful development, So said. North Korea's delegation said that Christian groups were trying to recruit North Korean migrants alongChina's border. "There are in the northeastern area of China so-called churches and priests exclusively engaged in hostile acts against the DPRK. They indoctrinate the illegal border crossers with anti-DPRK ideology and send them back to the DPRK with assignments of subversion, destruction, human trafficking and even terrorist acts," it said. China's envoy, Chen Chuangdong, praised "progress" by North Korea in the human rights field, but urged its ally to construct more health facilities and housing in rural areas.